Thuraya’s upcoming VSAT service and their Marinecomms product portfolio are on display for the first time at SMM Hamburg, the world’s leading trade fair for the maritime industry — Thuraya and the firm's long-time partner, IEC Telecom, will be co-exhibiting in Hall B6- B6.234 between September 4 and 7. 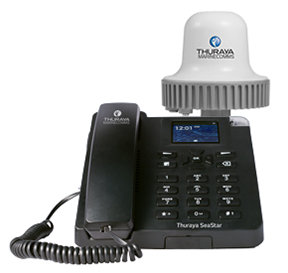 Another product highlight is Thuraya Orion IP, a maritime-specific broadband terminal, which supports broadband data communications at speeds up to 444kbps. Small, lightweight and easy to install, Thuraya Orion IP is suitable for business and crew communications. IEC Telecom comes to SMM Hamburg with their own hybrid terminal, the Orion Edge satellite voice and data solution, developed specifically by them to enhance the offshore communication experience. This technology offers high-quality telephony and high-speed broadband services, bundled along with budget control and consumption monitoring tools. Shawkat Ahmed, CCO at Thuraya, said that as the global maritime industry continues to operate in an extremely tough environment, ship owners are looking for new solutions to optimize the efficiency of their operations. Satellite communications is key to addressing these requirements and to offer new choices to the industry. 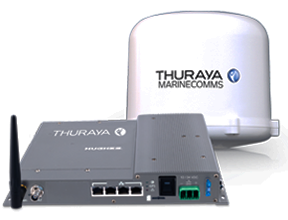 As established providers of marine satellite communications services, Thuraya understands the nuances of the maritime market needs and has delivered value-added products and solutions to fishing, naval, Coast Guard, merchant and leisure vessels, and operators of all kind of shipping lines for more than ten years. He added, "As Thuraya continues its focus on the maritime sector, the upcoming VSAT service will mark an important strategic milestone in the firm’s plans; advancing maritime strategy with the introduction of compelling cost optimization options. Thuraya VSAT offers an integrated platform that transforms marine connectivity by increasing offshore bandwidth capabilities and effectively caters to multiple applications including office-at-sea, crew welfare, cargo manifest and fleet operations. Thuraya VSAT has quasi-global coverage, delivering VSAT Ku-band and L-band services across land and sea. This includes coverage over major regional merchant shipping routes, offshore regions and coastal marine areas. Nabil Ben Soussia, Managing Director at IEC Telecom Middle East, noted that Thuraya VSAT service is an efficient, cost-cutting solution that allows users to rely on one service for all of their maritime communication needs. VSAT saves time, and delivers operational efficiency and improved decision-making. With a fixed-pricing model, its usage eliminates billing complexities and presents an attractive cost-saving option. Orion Edge redefines what is possible in maritime communications. Powered by Thuraya Orion IP, and Thuraya SeaStar voice terminal, and combined with a suite of value-added services, Orion Edge helps bring the consumption budget down by 30 percent, all the while improving operational agility and enhancing efficiency.